Coffee is one of the first things that come to mind when you think about Colombia, and the city of Manizales embodies that mental picture. Poised on the top of the Andes mountains, the city is one of the three that make up Colombia’s coffee triangle (eje cafetero). Lush green coffee plants blanket the hills. In some areas that surround the city, they are so dense and close to the roads that you can reach out and practically pick the beans. Manizales is sometimes referred to as the “San Francisco of Colombia” because of these steep hills. This beautiful mountain city has a population of 500,000 people and spreads out over approximately 220 square miles. Manizales sits at 7,000 feet of elevation, so its annual temperature averages a cool 63 F. The daily average high temperature ranges from 69 F to 72 F and dips down to the chilly mid-50s F at night. While there is little need for air conditioning, many people have small heaters or fireplaces in their homes to stay comfortable while they sleep. The mountain breeze and regular rainfall keeps the air clean and minimizes pollution. Founded in 1849, Manizales lies in the shadow of Los Nevados National Natural Park, one of Colombia’s most visited natural attractions. On clear days, you can see three snowcapped volcanoes, including the Nevado del Ruiz, the second most active volcano in Colombia, which last erupted in 2016. Each January, Manizales celebrates its annual fair—one of the best in Colombia. The fair highlights an elaborate international coffee queen pageant. Throughout the week-long event, locals and visitors also enjoy parades and street dances, musical events, handicraft exhibitions, and fireworks. At the end of August, Manizales celebrates its annual international theater festival, which attracts dozens of theater troupes from Latin America, North America, and Europe. The city held its first theater festival almost 40 years ago and today, the event attracts culture lovers from all over Colombia. The city also hosts jazz, film, and visual arts festivals that are gaining popularity each year. 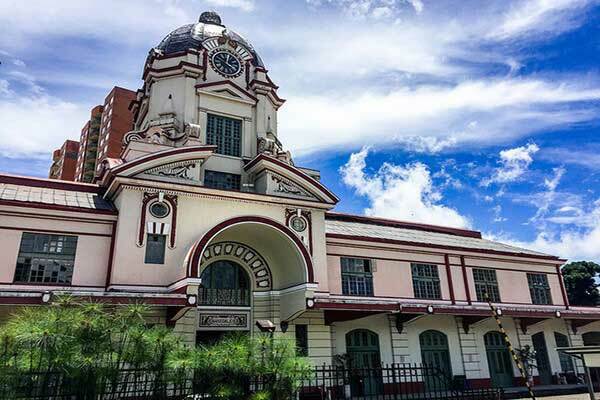 Some expats like that Manizales is more off-the-beaten-path than some of the other more well-known cities such as Medellín, Cartagena, or Bogotá. That also means fewer expats to socialize with and to be a support network. 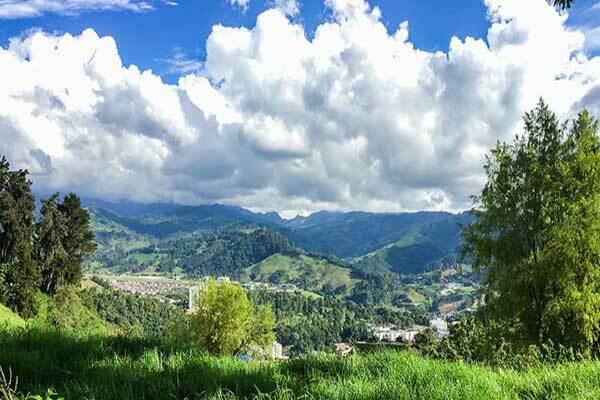 However, as more and more expats are discovering Colombia in general, those wanting smaller-sized cities are finding places like Manizales check all their boxes. 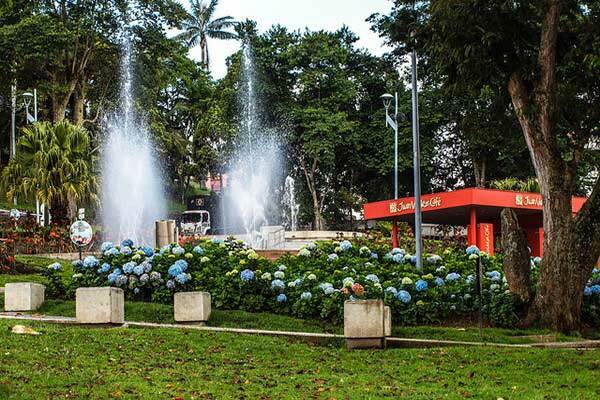 Manizales is a modern city with all the conveniences and services you need for comfortable daily life. The Cable Plaza square is one of Manizales’ most popular dining and entertainment zones. You can easily spot it because of the 177-foot tall cable tower replica. The trendy Milan area has over 50 restaurants from casual burger spots to white-tablecloth dinner venues. Manizales also has several large malls, including Centro Comercial Fundadores, the city’s newest shopping outlet. The mall’s shops have everything you need to keep up with the latest fashions, decorate your home, and make sure you have the latest electronic gadgets. It also has a pharmacy, supermarket, camera shop, casino, movie theater, and a large selection of restaurants. You’ll find dozens of gyms and fitness centers, along with rock climbing centers that offer classes for beginners. The private Club Manizales has facilities for golf, tennis, and soccer, along with a restaurant and events hall. Access to high-quality, inexpensive healthcare is always on the minds of retirees. In addition to dozens of small clinics, Manizales is home to the Hospital of Caldas, one of the top 49 hospitals in all of Latin America. It has a 24-hour emergency room, with two trauma suites, and is equipped to handle everything from basic primary care services to neurosurgery. The Hospital of Caldas has a 16-bed intensive care unit and delivers care in 22 medical specialties. Manizales’ La Numbia airport is tiny and only offers domestic flights to Bogotá and to Medellín’s in-town Olaya Herrera airport. Also, La Numbia airport only operates during daylight hours from 6 a.m. to 6 p.m. and it sometimes closes due to fog, rain, or wind. Getting around Manizales is not particularly complicated, but there are a few things you need to know to help with navigation. Because of the city´s mountainous topography, east-west direction traffic is flatter and faster than traveling north-south. Therefore, the main parallel thoroughfares are arranged longitudinally along most of the city’s length. The Avenida Centenario is the most important avenue with a north-south orientation. It connects downtown with the main transport hub where major access routes merge towards the city. Many parts of Manizales are not very conducive to walking. So, to help move people without increasing the number of cars, the Manizales Aerial Tramway opened on October 30, 2009. It is 1.3 miles long and connects downtown Manizales with the regional bus station. Each gondola holds 10 passengers and the whole system can carry 2,100 people per hour. The gondola was so successful that in 2013 the lift was extended to connect the Villamaria suburb to the downtown. In general, the cost of living in Manizales is 70% less than either Boston or Chicago. You can tailor your lifestyle to your budget. Choose to dine out every night or cook at home using inexpensive local produce and meats. Shop in the upscale malls or visit the local tiendas (small stores). Living comfortably on a $1,500 to $2,000 per month budget is certainly doable. Believe it or not, Manizales is one of the most famous cities for tango. It has even produced some world tango champions. The Calle del Tango (Tango street) is a conglomeration of three to four different bars and clubs which specialize mainly in Argentinian rhythms. Be sure to visit on weekends to see the local talent, dance culture, and nightlife. Even if you aren’t much of a tango dancer, most of the tango bars play a mix of tango, milonga, valse, rancherito Argentino, bolero, pasodoble, cumbia, and salsa. The historic district of Manizales centers around Plaza Bolivár and Manizales Cathedral. Towering over the city, this 371-foot high, neo-Gothic wonder is the tallest cathedral in Colombia and the third tallest in all of Latin America. One of the special features of the Cathedral are the 9,150 square feet of stained glass windows that surround the building, making it one of the most famous cathedrals in the world. In 1950, as part of the celebration of the city’s first centenary, the Cathedral was elevated to the dignity of Basilica. A day relaxing in the natural hot springs is good for the body and soul. The healing waters of Termales el Otoño come from 6,600 feet underground. By the time the water reaches the surface it can be between 120 F to 150 F. During the journey from within the earth, the thermal water acquires a myriad of different trace minerals that give it its healing properties. Some of the health benefits include: stimulation of the immune system, promoting good digestion, and accelerating metabolism. Bathing in the water flushes toxins out of the body. It can even help improve the tone and condition of the skin. Termales el Otoño offers day passes for $11.